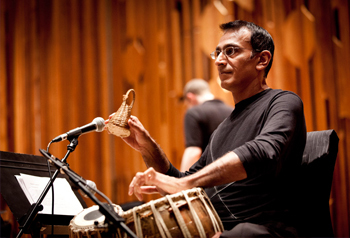 UK’s Kuljit Bhamra MBE is one of the most respected and sought after composers, musicians and tabla players whose music has been heard on albums, in the theatre and in the movies. He is a pioneer in the Bhangra music scene and is known for his traditional sounds as well as his mix and creation of new sounds that have enhanced the Bhangra phenomenon. His work has influenced and has made Punjabi beats and flavored music known through out the world. Kuljit was awarded an MBE in the Queens Birthday Honour’s List 2009 with the citation ‘For services to Bhangra & British Asian Music’. He is a creative, innovative musician and composer who likes to try new things and now has turned his talents on Christmas music. I got the chance to have a conversation about his Christmas album Jolly Bolly Christmas and it turned into not only a chat about the cool tunes and humorous story he has created for the CD but also we discussed a range of musical topics. I enjoyed every minute – it was fascinating, educational and inspiring! Check out the in-depth interview because we have something for everyone as he talks about Bhangra, Bollywood and of course Bollywood Bhangra Christmas music! Music is something I always wanted to do. Actually I come from a musical family, my mother Mohinder Kaur, was actually quite a famous singer in the community. When I was about six years old they use to force me to play the Tabla drums. I am pretty sure I was their “party piece” at family functions. (Laughs) Also they needed an accompanist and if you are going a lot to the Sikh temples, which is what my mother used to so with our family, the most common instruments used are the tabla and the harmonium. My mother and father say that my father tried to learn to play but he couldn’t do it and when he left his lesson I would sneak in and start to play them while they weren’t looking. They then realised I had a natural talent for them. Later on I developed a real feel and affinity for the instrument. But, of course, with the Asian mentality and my parents were quite strict they really also wanted me to have a professional career. My father used to always say to me, ‘Music is just a hobby’. So I ended up becoming a very good Indian boy and I qualified as a civil engineer. Later on I had one of those Eureka moments! I realised that a lot of my life was spent trying to please my father and so I then handed in my notice in 1993 and went into music full time. You know, I had already had a few platinum records hits before then but it wasn’t enough to poke me strong enough to give me the message. (Laughs) But I did finally get the message and here we are! 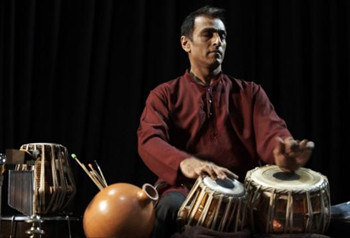 The tabla is probably the most common percussion instrument in India. Historians say originally it was a two-headed log drum, much like you find in many cultures. About 300 years ago, it is said that the drum got cut in half so that they could hang it on either side of the beast in battle and it became a war drum. In fact, one of the drums of the pair still has a kettle drum shape to it. The beautiful thing about the tabla is that it is tuned. One of the drums, that was originally made in clay, is copper and the other drum is a hollowed out tree trunk that has goatskin stretched out on top. The unusual thing about the tabla is that they have a black spot in the middle made of a very special compound of carbon and paste and that sort of enables it to produce a very bell like tone. I would say that obviously, it is very percussive, but it is also quite musical. It is a very recognizable sound. (He makes the sound here: a rising falling woooop is the best I can transcribe, but you know the sound and can hear it I bet). It is very commonly used in films and in soundtracks. It is a wonderful drum. It became my voice really. 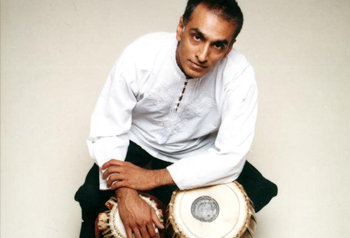 I play lots of other instruments as well but the tabla is my voice. If I couldn’t speak I would rather play. Bhangra music has been around for a very, very long time. It comes from the Punjab and the actual word Panjab comes from two words “panj” and “ab”. Panj meaning five. Punjab is the land of five rivers and so therefore the soil is very fertile and therefore the community and the people that come from the Punjab are a farming community or they are technicians that work on the farm. My family is from the Punjab and they were technicians so they built harvesters and they are very good at carpentry and stuff like that. In any farming community when the crop is harvested the people celebrate and what they did was drank and they danced. Bhangra was prominently a type of dance that you did, mostly done by men. It is a celebratory dance that is both about how great the crop is and how great and wonderful the people are too. What happened in England, which is very fascinating, is that Bhangra took on a different definition. It became the name given to a type of music and of the dance. So I now say that Bhangra is a British invention because it was created in England and then it went back to India and affected the Panjabi music and also Bollywood music in general. The thing about Bhangra is that it originally started as a folk type music and it is a very simple rhythm, which is a four beat rhythm, and it has a slight swing to it (he then sings the rhythm which I won’t try to transcribe but you know that beat I think) All Bhangra songs have that rhythm in it. It is a very catchy rhythmical type of sound with very simple instrumentation. Usually they are sung in Punjabi, but people like myself have tried to broaden the palette slightly and we have created songs in English and also in Hindi to sort of broaden the appeal. And as I say since it was created in England it always has a very strong Western influence. I have got quite a wide range of interests and you can see that when you look at my career and the things I have done. 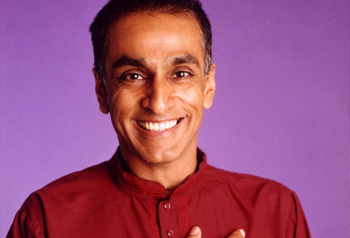 I have worked in theater like Andrew Lloyd Webbers Bombay Dreams, which was a West End show. I have worked on film soundtracks, Hollywood soundtracks, including some well-known films (Bend it Like Beckham, Little Princess). Like for example Johnny Depp’s Charlie and the Chocolate Factory, if you listen to that the Oompa Loompa song is actually a Bhangra song. If you listen to it again you will think say of that is Bhangra because you can hear the ‘dinga dinga dinga’….. Then there was the Four Feathers, Wings of a Dove – quite a lot of films. Then also solo performance with orchestras and other live shows. I think one of the reasons I have been able to straddle those different genres is because I am self taught I am quite open minded I suppose. I don’t mean to be rude to people who aren’t, but sometimes when you are taught in a particular fashion and a particular discipline it is difficult to leave that. For example, if you are an orchestral musician and you are very good at reading music it is sometime difficult to play freely without music in front of you. Conversely, if you are an Indian musician that isn’t following notation and is just playing an improvisation position then you would find it more difficult to read music. So because I have straddled those two worlds I enjoy collaborating and working with different artists from different cultures and backgrounds. 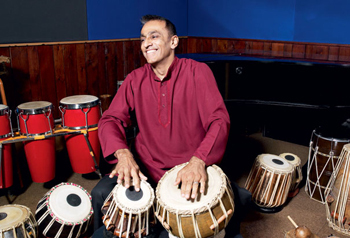 Take for example Bombay Dreams, the biggest challenge was for them was to find a tabla player that could do the same thing twice, because most Indian musicians can’t do that because they are improvising and playing in the moment. You never would hear a recital that was exactly the same that it was before – it is impossible. Whereas in Western music, the music is notated. Now it may not be exactly the same but you would recognise the piece and the form and the structure. So for me it was a brilliant opportunity working with Andrew Lloyd Webber to actually somehow notate what I was playing so if I was not able to do a show one evening someone else could step in and take my position. 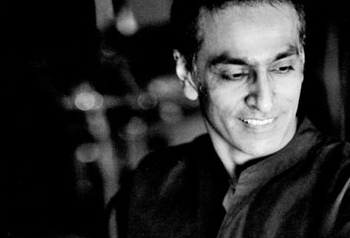 That was one of the most challenging things I have ever done and also one of the most rewarding things I ever did because then it led me on to creating a notation system for tabla, which had never been done before. It is all very exciting and I enjoy playing in all those different environments. It is a lot of fun. I have had an idea in my head for the last seven years of doing an Indian Christmas CD. It always surprised that it hadn’t already been done. In fact, one of my colleagues, who is rather pessimistic at the best of times when I said to him I am doing a Bollywood Christmas album. It has never been done before. He replied, ‘Well there is probably a good reason for that’. (Laughs) I decided to do it because it hasn’t been done and I thought I could do a good job with it! I thought that maybe I should construct some kind of story around it, a sort of narrative, where I could create a comedy tale and then interweave it with songs: a bit like a musical but more like a Bollywood musical in a way really. So we have a character called Bhangra Santa. Then you may know that Randhir is a very common Punjabi name, Randhir Singh, so I thought well Randhir sounds like Reindeer. We created this story were Randhir is ill, he has got the flu, so Bhangra Santa is stuck on how to deliver this year’s presents. He comes to England to hire a self-drive sleigh. The self-drive sleigh has got a navigation device called Sat Navinda and who is like a typical Aunty guidance mechanism. She says things like (Kuljit with Indian aunty accent): ‘You should have turned left 100 yards ago’ ‘Are you Married?’ ‘These girls and their clothes…’ It has a very funny story. I think it is the first time that I have recorded something where I have, in sort of a vulnerable way, have exposed my humor, which could be dangerous (laughs, but I wanted to do it. We have that story and then we have another story, which runs parallel to it about an English family from up North of England, their daughter has married an Indian boy from Southhall. They get together for their very first Christmas dinner and they exchange stories. It is all very light hearted and a bit of fun. With the music, I have really tried my best to make the music with integrity to the originals. I didn’t want to make sore of a pastiche. Of course, you could say they are parodies but I have done the best that I can to orchestrate it with a live orchestra and do it properly. I think some of the songs have come out really beautiful. I have done an instrumental version of the ‘Deck the Halls’ and I am really pleased with that. It is strange because I can’t take credit for the original melody of that song because they have survived hundreds of years but somehow the arrangement with the Indian flute and the Indian percussion has come out I think really nice. The ‘Ding Dong Merrily on High’ sung with an Indian classical voice is a really nice number. One of the things that is done in Indian music is a lot of vocal, well I call them acrobatics, but there is a certain vocal technique in Indian music and especially that bit in Merrily on High where it goes (he sings the Gloria stanza, the dabadababadaa badaba is impossible to transcribe – you can hear it I know you can!). That is the sort of thing an Indian singer would love to improvise on and so I have done that and that has come out really nice. Some of my friends say it gives them goose bumps, which is very nice. So those are my two favorites. There are new songs as well. They are not all re-imagined takes of existing carols there is also two or three brand new songs which I am also pleased with. There is a Bhangra group that I have worked with many years ago in the early 80s called Premi and I called them back for a Punjabi Christmas song. Then I am working with an amazing young singer called Shahid who sang the Hindi Punjabi song. Both those songs are really, really nice. I have also done some Christmas cracker jokes. Yes, I have made up some really, really bad jokes that people can put into crackers. I have written some jokes I am quite proud of. Yes, they are all groan worthy. There is a lot of effort that has gone into this Christmas CD and I am really pleased that it has come out the way it has come out. It is a bit of fun and some really nice music! Hopefully people will think that. I hope it is embraced by all and I think will appeal to a cross-cultural audience. There is a large Indian-Christian community so I hope they will sing these songs. Christmas is a big thing, you can’t underplay that, and I think there is a big audience out there. I really did it to express a musical side of it rather than lets make a Christmas album because it will sell loads. I really enjoyed working on the music. I am very pleased with what I have done and I hope audiences take it to heart. I hope people respond to it in a positive way. I think Christmas is a time of giving and I think it is nice to embrace the whole of humanity and I hope it rides on that. Maybe in the last 5 to 10 years I have noticed that I am not watching as much Bollywood as I used too. I travel to Indian once or twice a year and I work in Bombay with some of the industry. Among the creatives and the industry the attitude has changed. It seems to me the creaters and filmmakers are creating not with a view to longevity. The will create a film, they will market it and PR it for 13 weeks and then it will be done and dusted and then it will be on to the next one. The music seems to be not very Indian. If you took out the Indian voices it would sound like any other track. To be honest the last film I really loved watching was Devdas, I love the music in that. It is what I would call Indian music. I may be old fashioned in my thinking so forgive me that. But Devdas is lush, it is well made, it is well directed, the cinematography is fantastic, the colours are great, the story is good and there is good music. There is a sort of quick buck attitude that has infiltrated, it is more about a product that is going to last for a short time and on to the next one. Whereas in the old days I think when you made songs, you wanted to create songs that would last forever or tunes you could whistle. It is very rare nowadays that I come out of a Bollywood film whistling a tune. Maybe I am getting old but that is my honest of opinion of Bollywood at the moment. I find myself listening to the old songs with the violins. When I go to record in Bombay now and ask for a twenty-piece orchestra there is nowhere in Bombay you can record a twenty-piece orchestra because all the big studios have gone down. So all the string players they overdub, so you get five violinist that dub twenty times, but then it doesn’t sound like a hundred people… it sounds like five people dubbing 20 times. Part of me wants to blame the computer for this but I really can’t. I still record all my music live, I live in the recording studio so I am really passionate about recording music as opposed to using computers to create music and samples. You can hear the difference. And this is not just about Bollywood music. But even in India now when you go to the studios and say you book a singer to come sing a song, the singer will say, ‘Okay I will just sing it four or five times, you take the bits that you like’. I say, ‘Well actually no. Can you please stay here for three hours and let’s sing it and get it right’. You can hear when stuff is cobbled together with computers. Do you know young kids ask me all the time, ‘Hey, I love your record, man. Where did you get your beats from?’ And I say, ‘Well, I played them,’ and they say, ‘No, where did you get your beats from?’ And I say, ‘NO! NO! I PLAYED THE BEATS!’ They don’t understand what I am saying. It is interesting. Part of it is to do with computing and the way programs are accessible to everybody. I think we are going through a phase of this technological revolution and then I think we will come out of it, hopefully, standing high. You know, in the old days we used to by records. I always believe it is called a record because you are buying a record of an event. Like you couldn’t make the concert so what you are buying is a record of that performance. So in my opinion a recording should be a recording of a performance, but what is happening nowadays is there no performance. You can make a virtual band in a studio and get away with it but I think you can tell bcause sometimes the soul is missing. I think live music is coming back; there are signs there. I really do hope the live music scene, playing an instrument, learning to play an instrument, performing comes back. What has been great is that young boys and girls are playing the Dhol drum. I think that is really cool because they are beginning to appreciate the artisan quality of playing. I think music scene is vibrant and still thriving but as I said what I think needs to come back is the recording scene and the live band screen and I think it will. 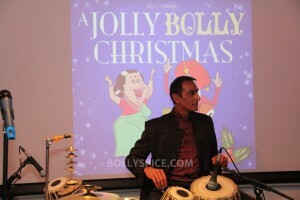 Jolly Bolly Christmas is available now at Amazon, iTunes and www.kedarecords.co.uk be sure to get your copy and make it a Jolly and Bolly and Bhangra filled Christmas! 17 queries in 0.664 seconds.